Monster High™ Shines Spotlight on New "Monster High™: Frights, Camera, Action!" DVD and Doll Playset | Mattel Inc.
EL SEGUNDO, Calif.--(BUSINESS WIRE)-- Today, Monster High™ launches its 4th direct-to-DVD release - Monster High™: Frights, Camera, Action! - with new monsterfied characters and a scary-cool new plot! Led to believe she's the rightful heir to the vampire throne, Draculaura™, along with her best ghoulfriends, is whisked away to Transylvania for a royal coronation to die for. Soon, the ghouls discover that the hunt for the Vampire queen is not over and it's up to them to uncover the truth in a fangtastic adventure that takes them from the Tower of Londoom, to a haunted river boat in New Goreleans™ and finally to the glamorous boovie lots of Hauntlywood™. 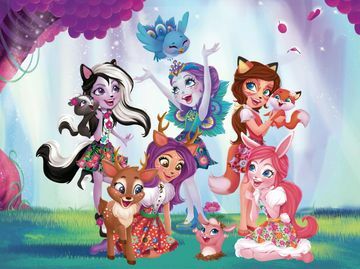 The mystery-filled film also introduces new ghouls - Elissabat™, Honey Swamp™, Viperine Gorgon™, and Clawdia Wolf™ - and girls can have their own screamplay with a line of new character themed dolls accented and accessorized with touches of Hauntlywood™ glam. Available at retailers nationwide, the Monster High™: Frights, Camera, Action! DVD retails for $19.99. Visit www.monsterhigh.com for more information. MONSTER HIGH and associated trademarks and trade dress are owned by Mattel (NASDAQ:MAT). ©2014 Mattel. All Rights Reserved.